1. Hide the bike in the garage or other location. Take a picture of the bike. Wrap the picture up in a small box or slip it inside a holiday card along with a note on where to find the bike. 2. Wrap a new helmet, bell, or other accessory along with a note on where to find the bike. 3. 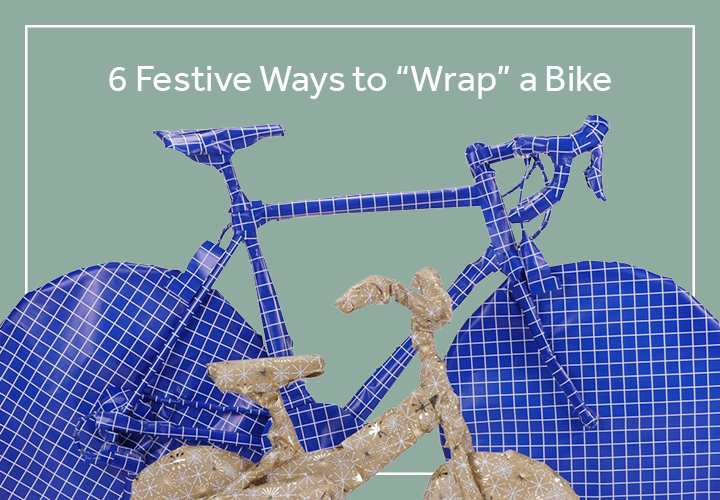 For older kids, wrap pieces of the bike separately so they have several items to open. Then they can assemble the bike themselves or with some help from parents. 4. Skip the wrapping and put some big bows or balloons on it. Or wrap strings of holiday lights around the bike, using zip ties, ribbon, or twist ties to keep the cords in place. 5. Hide the bike in a room. Then cover the door to the room with wrapping paper so the recipient has to pull the paper off to open the door and find the bike. 6. Cut a small hole in the bottom of a gift bag. Place a ball of string or ribbon in the bag and thread the end out of the hole. Hide the bike and tie the end of the string or ribbon to it. Wind the string or ribbon through your home to create a path for the recipient to follow. Fill the bag with candy or other small items to cover the string or ribbon. No matter which method you choose, keep your camera ready so you can capture their smile when they discover their brand-new bike!